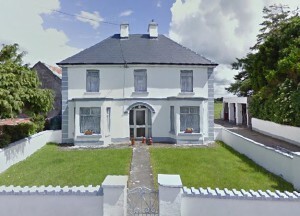 Grandmother Fahy’s house, County Galway. I recently went to Ireland to visit my dad’s family. Having investigated my grandmother’s ancestry on a previous trip, I wanted to focus this time on learning more about the Fahys. Thomas was born in December 1914 in Tuam, County Galway, and was the oldest child in his family. Thomas’s parents were Matthew Fahy and either Julia Howley or Sarah Fahy. Matthew Fahy was born around 1880, probably in Tuam. The farm where my dad grew up was once owned by Thomas Fahy’s unmarried uncles, and was given to him in the 1940s or early 1950s. The house in which my father grew up was built in the 1940s and was not the original farmhouse; the original house was set farther back on the property. Though this information did not contain many specific names, dates, or places, I began my search. I located an indexed birth record for a Thomas Fahy born in Tuam between October and December 1914 in the Ireland, Civil Registration Index, 1845-1958 at FamilySearch.org. I also found a likely marriage record for Thomas’s parents, Matthew Fahy and Julia Howley, in Tuam between January and March 1914. I ordered both records from the General Register Office in Ireland. The ruins of Grange Castle, County Galway. While waiting for the records to arrive, I used my subscription to RootsIreland.ie to search for birth and baptism records for a Matthew Fahy born in County Galway around 1880. Though I could not find a baptism record for a Matthew Fahy born in Tuam, I did find a Matthew Fahy baptized in Lackagh, County Galway, on 8 August 1886, son of John Fahy and Ellen Cooly. What struck me was the listed address for Matthew Fahy: Grange Castle. My dad grew up in Grange, and right down the road from my grandmother’s house is the ruin of a castle. 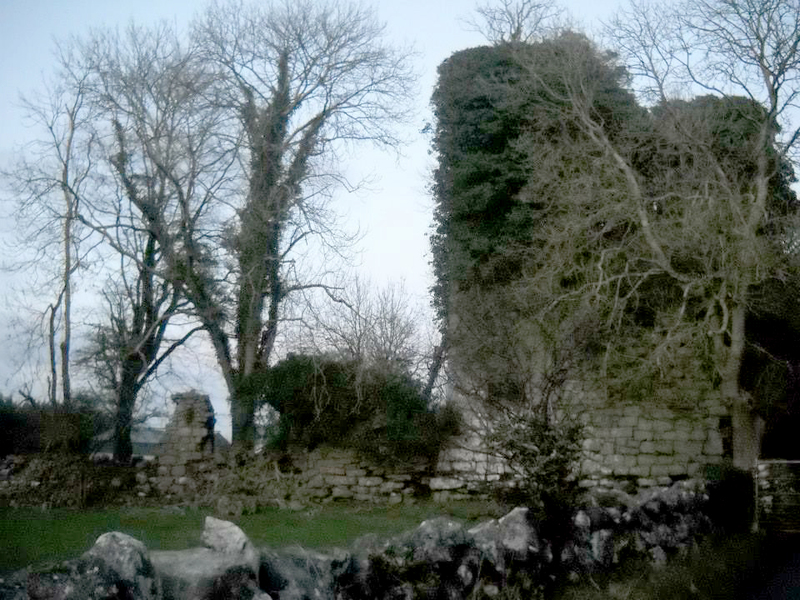 A quick search of castles in County Galway revealed that Grange Castle is in fact the ruin near my grandmother’s house. My dad showed me the location of the original farmhouse when we were visiting, which was much closer to Grange Castle than the current house. Perhaps Matthew was born in Grange rather than Tuam. 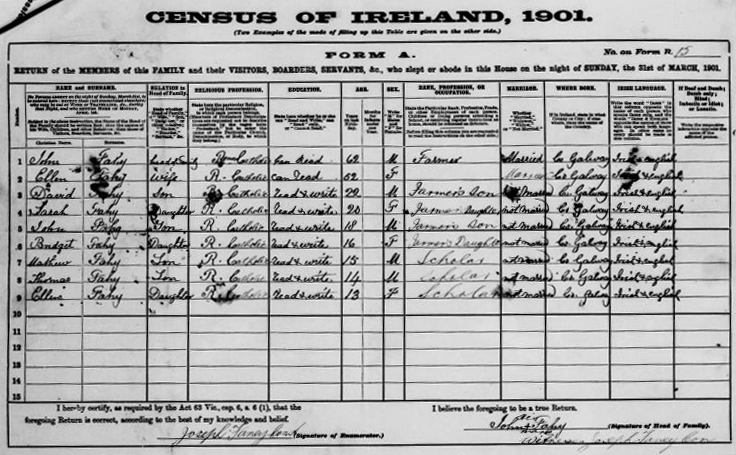 1901 Census of Ireland, showing the Fahy family. I then searched the 1901 and 1911 Censuses of Ireland (available at the National Archives of Ireland), and found that Matthew had seven siblings: Mary, David, Sarah, John, Bridget, Thomas, and Ellen. In 1901, John and Ellen Fahy were living in Grange East, Lisheenavalla, County Galway with seven of their children, including Matthew. By 1911, however, Matthew’s brother, David, was listed as the head of household, living with sisters Delia and Nellie (common nicknames for Bridget and Ellen). Though it is entirely possible that David could have married after 1911, he could also have been the unmarried uncle that Thomas received land from. I still need the birth and marriage records from the General Register Office to confirm my findings. But the family stories I was told, though lacking in dates, allowed me to weed through the many Fahys of County Galway and pointed the way to these probable ancestors. 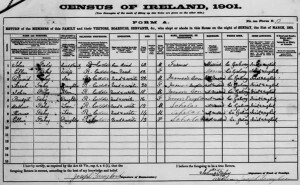 Ireland, Civil Registration Indexes, 1845-1958, index, online database at FamilySearch.org, citing General Registry, 4:353 [FHL 101,075]. Ireland, Civil Registration Indexes, 1845-1958, online database at FamilySearch.org, citing General Registry, 4:307 [FHL 101,262]. Matthew Fahy (1886) indexed marriage, website of the Irish Family History Foundation, online at RootsIreland.ie. 1901 Census of Ireland, Lisheenavalla, Grange, East, County Galway, unpaginated, household no. 15, digital image, Census of Ireland 1901/1911, online database at http://www.census.nationalarchives.ie/, original manuscript not cited. 1911 Census of Ireland, Lisheenavalla, Grange, East, County Galway, unpaginated, household no. 3, digital image, Census of Ireland 1901/1911, online database at http://www.census.nationalarchives.ie/, original manuscript not cited. My Irish on my mother’s side is the brick wall I’ve been beating my head against for a long time! They arrived in the mid to late 1850’s, married here, moved from PA to IL to IA to KS according to federal censuses. I have tried to find them in naturalization records in various states, no luck so far. I tried Catholic church records but at that time in the rural Midwest, circuit riding priests’ records rarely made their way to the diocese archives. Land purchase records also come up empty. Part of my issue is the common name making it harder to narrow down with so little info. Also Midwest states didn’t require county or state vital records till after 1877, when their youngest was born. I know the husband died between the Kansas state census of 1885 when he is head of household & 1900 when his widow is living with 3 of her sons in Topeka; the family was not found in 1895 Kansas census; I don’t know why. I am currently trying to find marriage and/or death records for these ancestors’ children but have been unable to trace the children’s migration patterns. I’m not sure where to go from here except to Des Moines and Topeka to see if there are records that have not been digitized. Have you had any responses so far? I have not which makes me wonder what is the point of posting a question if no one has or will give an answer. I appreciate the commiseration, we are stuck here withi the circle of “no data so no data” can be found. Good luck and think of me if you get lucky or any form of an answer. Hello Katrina, I just found your post on find Fahys in Galway. I too have been searching for Galway Fahys. My great grandparents were John Fahy and Ellen Cooley who you mentioned in this post. I was told that they had 13 children and only just recently found birth records for a David and Matthew although I never heard of them specifically. Would love to hear from you and see if we have any common cousins!